1 of 2 In a medium-size bowl, stir together chicken, 2 tablespoons of the flour, 1/4 teaspoon of the salt and the pepper; add to slow cooker. Stir in potatoes, carrots, celery, onion, mushrooms, garlic, 1/2 teaspoon of the thyme, the sage and broth. Cover and cook on HIGH for 4 hours or on LOW for 6 hours. 2 of 2 In a small bowl, stir together remaining 1 tablespoon flour and the butter until a paste forms. 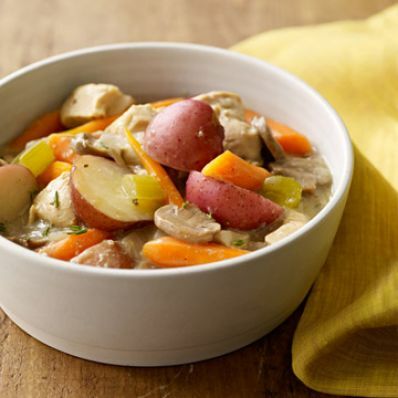 Push the chicken and veggies to one side and whisk paste, remaining 1/4 teaspoon each salt and thyme into slow cooker bowl. Cook 1 more hour or until thickened.